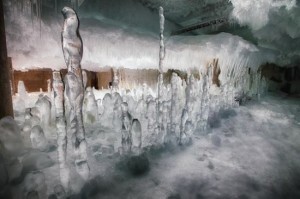 A recent trip to an old cold storage building has yielded photographer Gary Jensen with some truly amazing results. Chicago’s Fulton Market Cold Storage moved to a new location last year, leaving their former ten-story freezer warehouse open to new development. However, before being converted to office space the entire building had to be defrosted. Lucky for us, Gary Jensen was invited to photograph the process, which produced some amazing ice formations reminiscent of those found in caves during the winter. Check out the gallery on his website, garyrobertphotography.com.